France’s presidential Elysee palace has confirmed that Emmanuel Macron’s two-day foreign trip to Serbia this week is being postponed as a result of the weekend violence in Paris. Serbia’s president says French President Emmanuel Macron has postponed his visit to Serbia after France’s worst urban riots in years. Macron was to arrive in Belgrade on Wednesday for a two-day visit. Paris has witnessed three straight weekends of clashes. The protests began last month with motorists upset over a fuel tax hike and have grown to encompass a range of complaints against Macron’s government. The Elysee said the French leader also wanted to understand how they are coping and the difficulties they faced in handling one of the nation’s worst episodes of unrest in recent times. The Paris police chief has said officers had physical confrontations with demonstrators using hammers, gardening tools, bolts, aerosol cans and rocks. 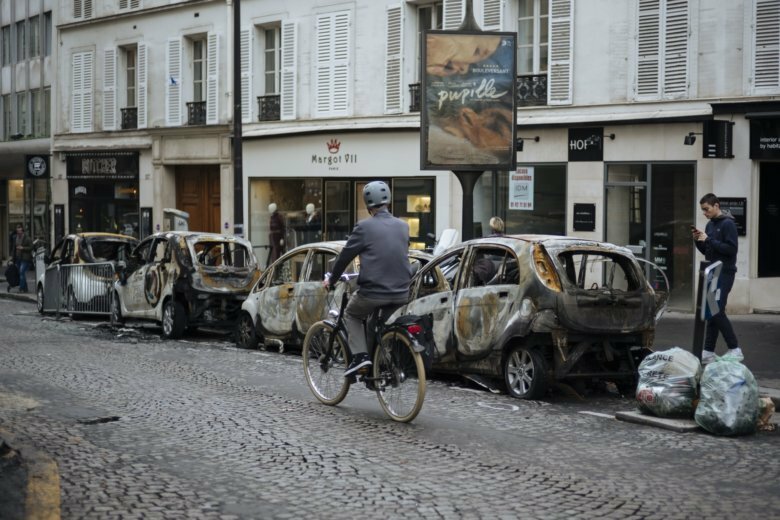 Saturday’s demonstration against increased taxes and living costs devolved into France’s worst urban riot in a decade. More than 130 people were injured, including 23 police officers, and 412 people were arrested. France’s finance minister, Bruno Le Maire, has warned that the violent protests and road blockades will have a negative impact on the economy. The movement, which has been partly stoked by a fuel tax hike, is hurting sales, according to Le Maire, who said at the ministry that “the impact on the French economy was serious” and that some sectors have reported sales declines of between 15 to 25 percent. Germany’s foreign minister says his country isn’t worried about anti-government protests in neighboring France and he’s confident the situation will calm down soon. In Paris, Prime Minister Edouard Philippe was holding crisis talks with representatives of major political parties. President Emmanuel Macron held an emergency meeting on security with Philippe on Sunday and the government hasn’t ruled out the possibility of imposing a state of emergency. It was the third straight weekend of clashes in Paris. The protests began last month with motorists upset over a fuel tax hike and have grown to encompass a range of complaints that Macron’s government doesn’t care about the problems of ordinary people.